Ysaye Maria Barnwell, singer, composer, educator and more, is best known for herwork with Sweet Honey in the Rock. This site brings you information about her workshops and her music. Primarily A Capella catalog of recordings and songbooks, lists concert info, profiles of recording artists, information about the A Capella Summit conferences, great links to all sorts of related sites. The Music for People Institute is the work of David Darling, cellist and improvisation coach, teacher, master. You will find much to inspire you in David's work. This site will hook you up to workshops and events. Rowe Camp and Conference Center, Rowe, MA, is where you can attend a huge variety of workshops with leading musicians, writers, teachers. Vocal Area Network is a resource site for New York City singers with information on auditions, concerts, workshops. The Western Wind Vocal Ensemble office is in NYC. This site brings you their catalog, upcoming events, concerts and workshops. 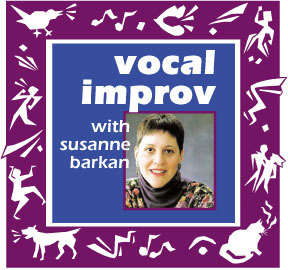 Susanne Barkan's Toast & Jam Vocal Improv Workshops. You're here! Julie Lyonn Lieberman is a violinist, vocalist, teacher, writer, composer, and performer well worth visiting and learning from. She has an extensive resume, and much to offer. Just go see for yourself. If you like great vocals, click Links for access to the Primarily A Capella Catalog, where you will find a whole world of recordings, new and old, of fantastic vocal talent from the Moonglows to Libana, from Swingles Singers to Western Wind.